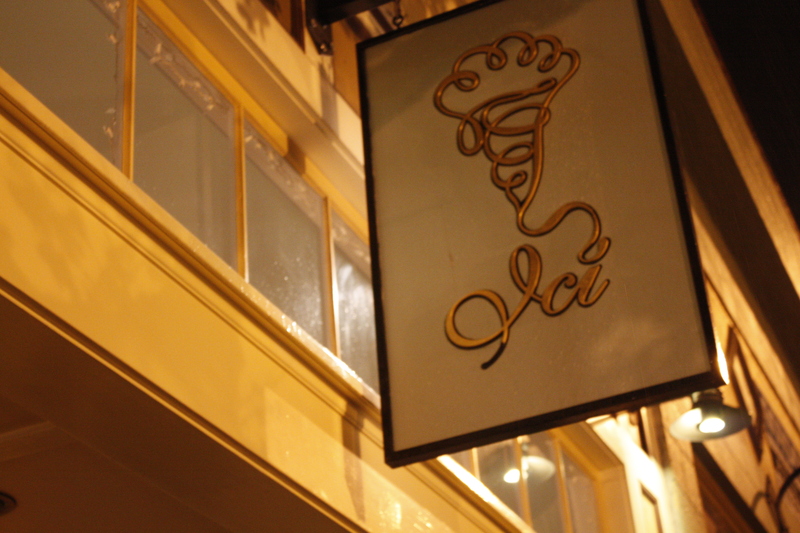 Ici was everything we had hoped it would be. The adorable ice cream shop was busy, but there wasn’t the typical line out the door on the rainy evening. 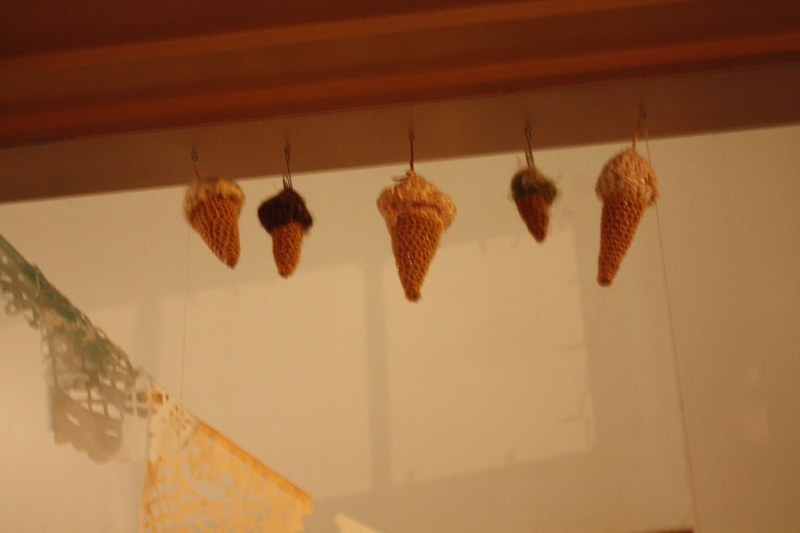 We loved the crocheted ice cream cones dangling along the window. 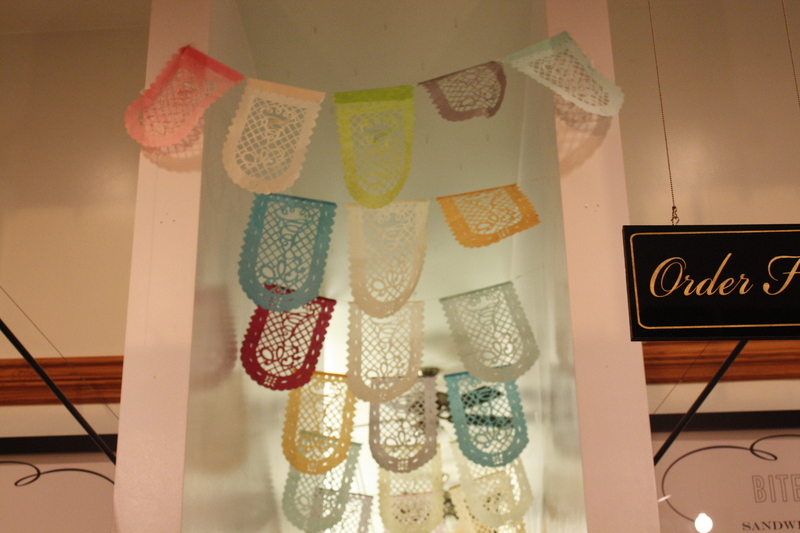 The pastel paper cut outs also featured ice cream cones and Ici. Very whimsical and fun. 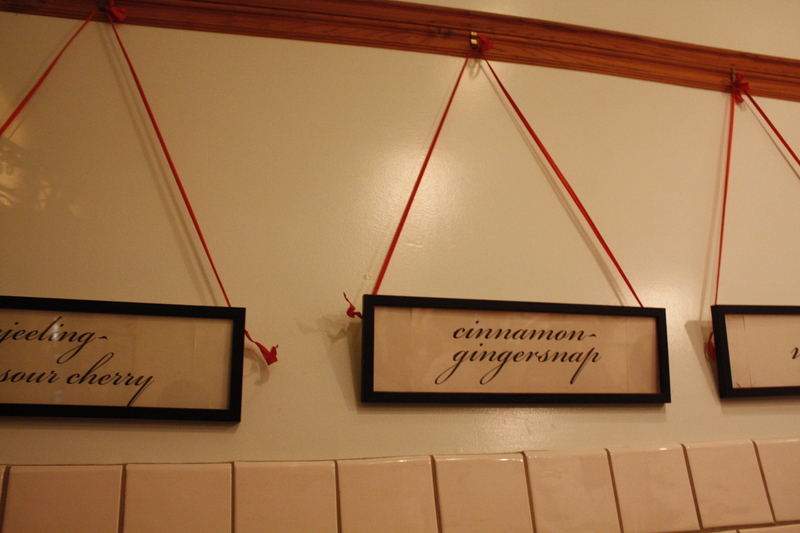 We were impressed with the creative ice cream flavors that were so unique. Just check the Twitter for daily ice cream flavors. That evening there was Scotch Caramel Swirl, Huckleberry Yogurt sherbert, Malted vanilla, Honey Nougat, Cinnamon-gingersnap, Darjeeling sour cherry and Coffee hazelnut praline. 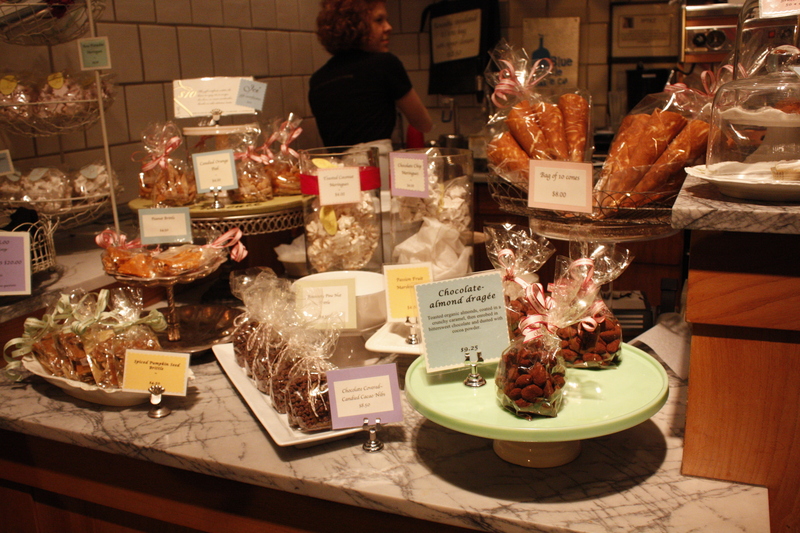 Ici also sells treats of all sorts including citrus peels dusted with sugar and their signature sugar cones. They also sell crunchy nut brittle, based on peanut brittle, with a hint of salt. They have flavors like rosemary-pine nut, cinnamon-pecan, cashew-orange, hazelnut-cocoa nib and traditional peanut. We did a second glance over at the homemade peppermint marshmallow and fresh meringues and Ici offers up flavors like hazelnut, chocolate chip, espresso, matcha and rose pistachio. 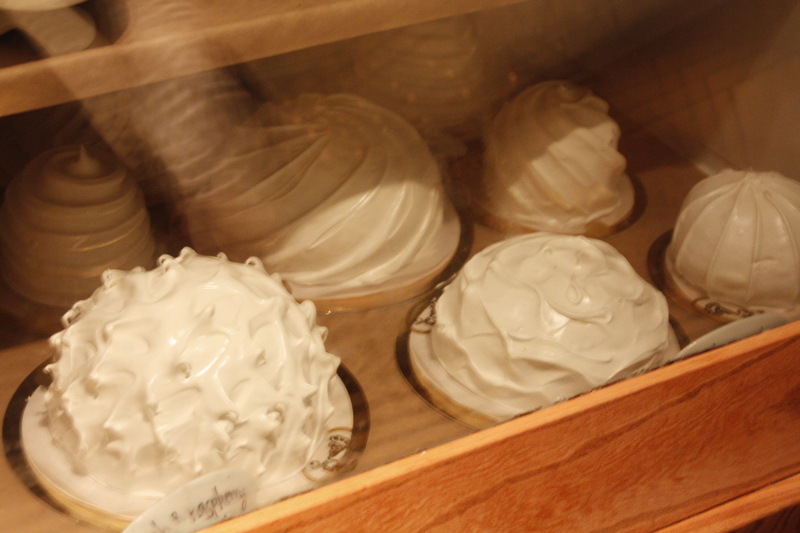 The baked alaska in the case were winter white and quite fluffy. 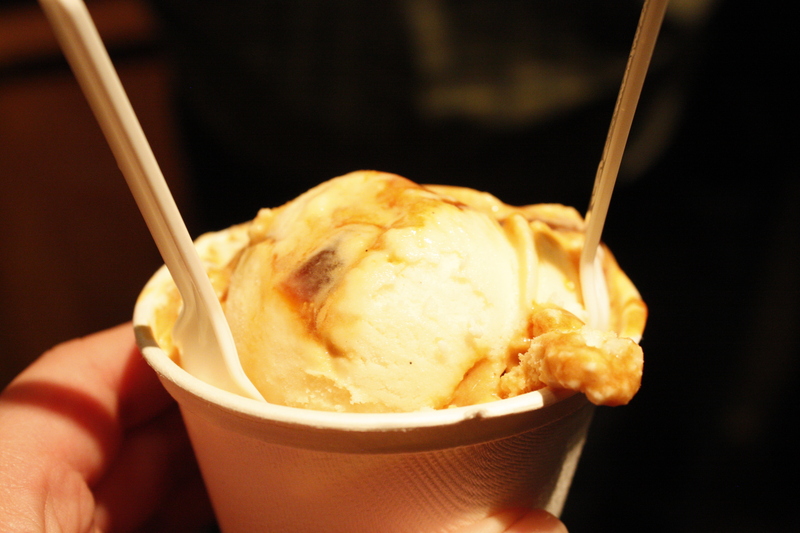 We sampled 2 flavors each and then decided on Scotch Caramel Swirl. Amazing. The slightly adult, scotch flavor paired well with the sweetness of the deep and gooey caramel. Besides ice cream, Ici brews Blue Bottle Espresso (BMH’s review of Blue Bottle) and a dreamy looking hot chocolate. Will have to return to try other unique flavors and an affogato. Mmm. Making me wish I was back in Berkeley, at least long enough to get a cone.